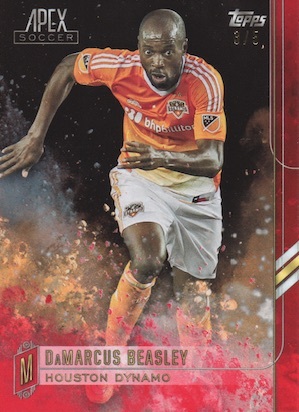 2015 Topps APEX MLS is a new addition to the growing Topps MLS soccer arsenal. Focusing on artistic designs, master hobby boxes include two autographs and one relic card. 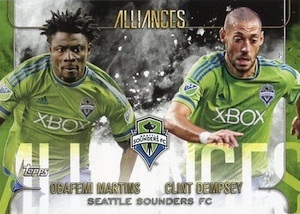 The artistic 2015 Topps APEX MLS design is much different than MLS collectors have seen since Topps took over the card license. Including 100 cards, the base set features MLS rookie cards for David Villa, Frank Lampard, Sebastian Giovinco and Mix Diskerud. There are also several colorful parallels including Gold (#'d), Orange (#/25 - Hobby), Red (#/5), Black (1/1) and Printing Plates (1/1). Base Card Short Prints are a limited option that covers players that are not included in the base set. 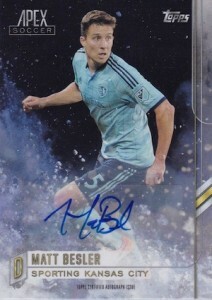 2015 Topps APEX MLS autographs average one per mini-box and two per master box. New signers include David Villa and Jorge Campos. The Base Autograph set is further enhanced with Gold (#'d), Orange (#/25 - Hobby), Red (#/5) and Black (1/1) parallels. Now and Then Dual Autographs are serial numbered and pair top former players with current stars. Dual Autographs (#'d) feature two autographs but only include current players. Both combo signature cards also have a Red (#/5) and Black (1/1) parallel. Falling as a hobby-only case hit, Match Day Die-Cut Autograph Relics include a signature and match-used soccer ball piece. There are also Red (#/5) and Black (1/1) parallels. 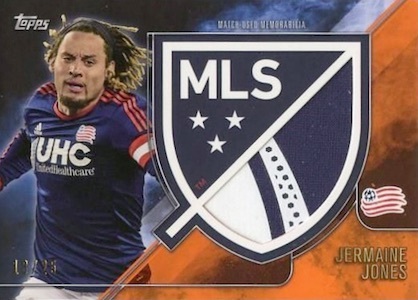 Relic cards average one per 2015 Topps APEX MLS master box and include two main options. 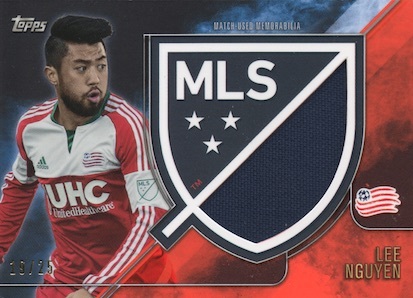 Crest Jumbo Relic cards are only found in hobby boxes and feature a large jersey swatch integrated into the new MLS crest. Gold (#'d), Orange (#/25), Red Patch (#/5), Black Adidas Logo (1/1) and Printing Plates Prime Patch (1/1) parallels offer additional rarity and nicer relic pieces. Dual Relics combine two players with jumbo relics. The serial numbered cards also have Red (#/5), Black (1/1) and Printing Plate (1/1) parallels. Two inserts round out the product. Captains honor the team leaders like Robbie Keane, while Alliances pay homage to the top player pairings in the league. Both inserts also have parallels. This includes Gold (#'d), Orange (#/25 - Hobby), Red (#/5), Black (1/1) and Printing Plates (1/1). Hobby only. 1 per box. Good: Quality base design, thick jumbo relics, includes some of the new stars like Steven Gerrard and Kaka, fair pricing. Bad: Rough card cuts, sticker autographs, still missing some of the biggest autograph subjects. 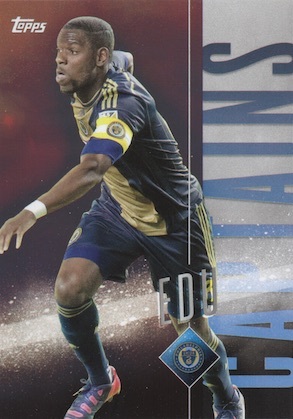 The Bottom Line: 2015 Topps MLS Apex Soccer is a strong product across the board. Box prices are reasonable and you are still guaranteed three hits. 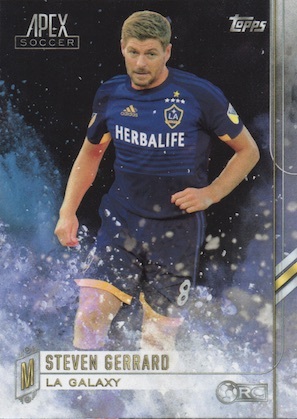 The appeal might be dampened if you are not a fan of the digitized background on every card, but outside of that, this is one of the best MLS products in some time. The overall design of Topps Apex makes me think of a Topps Fire hybrid. The background is abstract and smokey with a primary splash-like design. A dark portion behind the player helps the image stand out more. There is also a nice finish on the player image that gives it a quality look. Team colors are applied, giving the base set some variety. 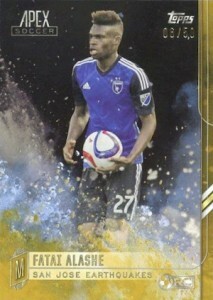 It looks good and the design concept is new for MLS cards. I think they did a pretty good job. The main criticism I have for the base cards is the rough cuts. Fuzzy/chipped card edges are a pet peeve of mine and there were several in my box. I also noticed some of the cards had small indentions on the back. The autographs are a different story. I know stickers are not likely going anywhere, especially in non-premium products, but given the strength of the design, slapping a sticker autograph on the card seems a little more egregious. As I flipped through the base stack, it was hard not to think how nice a hard-signed, silver ink autograph would look. Another key component, the Crest Jumbo Relics are a guaranteed box hit and noted as match-worn on the front. This is a plus, for sure. While they feature a quality design, they are a little deceiving. Although the actual crest is indeed jumbo, over half the crest is actually just card itself. While I have no idea how much jersey is actually in there, the visible portion is not quite jumbo in my opinion. Still, the look works and the stock has a solid thickness. I did not pull one, but from what I have seen online the Match Day autograph relics have a very unique design. I also found it intriguing that the relic is a match-used ball. It would be very cool if the ball was used in an actual game by the player in question, but unfortunately, the back just offers the normal ambiguous disclaimer. Beyond that, the average box will yield a few inserts and parallels. While there is nothing especially noteworthy in that regard, I appreciated the overall restraint on both counts as volume has gotten ridiculous in some lower-tier products. With the new high-profile additions to the league, the checklist is even more important than normal. For those that are wondering, David Villa, Kaka, Steven Gerrard and Sebastian Giovinco made the base set. David Villa and Kaka are also included in the base autographs, which definitely helps value and interest. Still, it would have been nice to have seen Gerrard and Giovinco with autographs present as well. And of course it would have been fantastic to include the other big additions, like Lampard, Pirlo or Dos Santos, but I realize the time constraints were too great. For too long, I felt MLS products refused to accept that their pricing should be more in line with the actual value. 2015 Topps MLS Apex makes greats strides on that. It’s hard to beat a product that delivers two autographs, one relic and stack of base cards for under $50 per box right out of the gate. Sure, until there are actually huge value subjects, the ceiling will always be more limited than other sports. But at that price, it is much more reasonable to work with. Plus, Kaka and Villa help a ton with value. 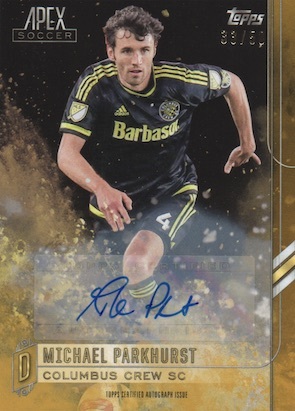 As you may have guessed, I really enjoyed 2015 Topps MLS Apex. Solid designs, good value and multiple hits works out to a fun break. For me, one thing that did detract from the fun was the box format. I opened a sealed box, which is basically just two big packs with 32 cards in each. I think the one-pack format works better with hit-only products and wished that this would have been more packs (maybe eight to ten). That may not matter to most people, but I did find myself thinking that. Regardless, the overall experience was quite enjoyable even though I did not pull anything huge. How many hobby boxes in a case? The standard 12? brad � The solicitation shows 8 master boxes per case. Hey, according to the Topps KICK app producer Chari Bayanker there will be Topps KICK redemption cards in here? kevinmitro � What Alan said. There are retail Blasters that include one autograph per box and exclusive Green parallels. kevinmitro – Green Parallel version only available in retail version. kevinmitro � No problem. You too! If you think these are good, wit until you see Panini’s Select Soccer. Loving this set! Great look cards, fantastic price point for what you are getting. I can confirm there are cross over cards that have a code that you gives you the digital card as well.